<p /> Meet "Pure Threads," the sustainable capsule collection from renowned Italian designer <a href="http://www.ecouterre.com/emma-watson-alberta-ferretti-to-collaborate-on-eco-fashion-collection/">Alberta Ferretti</a> and British actress <a href="http://www.ecouterre.com/actress-emma-watson-models-her-third-and-final-people-tree-collection/">Emma Watson</a>. Comprising five lace-embellished pieces—two dresses, a shirt, a long skirt, and a denim short—the range marries Ferretti's romantic flourishes with Watson's youthful zeal. Click through our slideshow for the complete lookbook. <p /> Watson first teased the partnership in November, when she revealed that Ferretti had written her about a potential alliance. “She wrote to me and said, ‘I saw what you did with People Tree and I think it’s a great idea and will you do something with me?’” Watson told <em><a href="http://www.ecouterre.com/emma-watson-alberta-ferretti-to-collaborate-on-eco-fashion-collection/">Us Weekly</a></em>. <p /> "The clothing will be “very classic, ’60s Jane Birkin,” Watson divulged back then. <p /> Watson and Ferretti had a common vision: the collection should be easy to wear, accessible to a broad audience, and unabashedly feminine. <p /> A press release bills the five pieces as the "perfect number...to create an innovative summer wardrobe." <p /> The collection will be available exclusively at <a href="http://store.albertaferretti.com/navigation.asp?tskay=088B6E19#/purethreads/mm/4/season/main/gender/D">AlbertaFerretti.com</a> from the end of March. A portion of proceeds benefit the <a href="http://www.peopletreefoundation.org/">People Tree Foundation</a>. 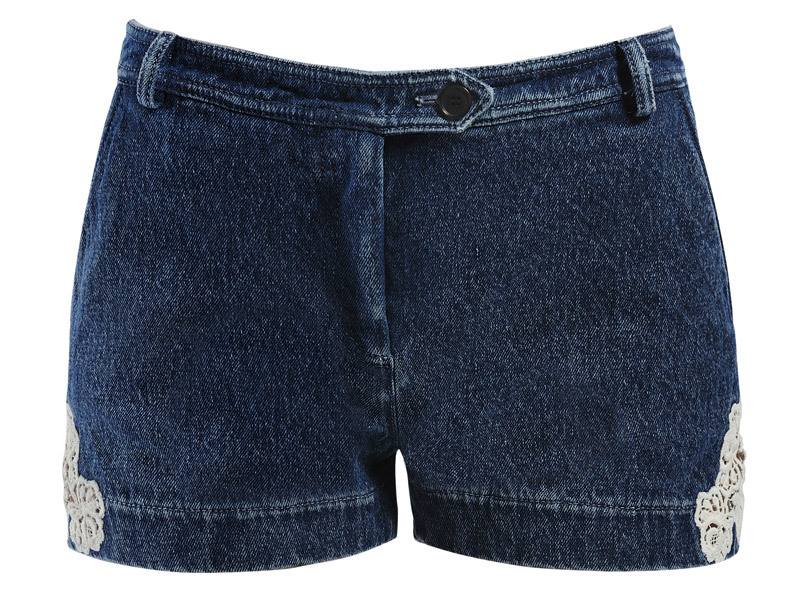 <p /> Featuring embroidered lace panels on its side, the denim short ($340) is made from organic hemp and stonewashed <a href="http://www.global-standard.org/">Global Organic Textiles Standard</a>-certified cotton denim. 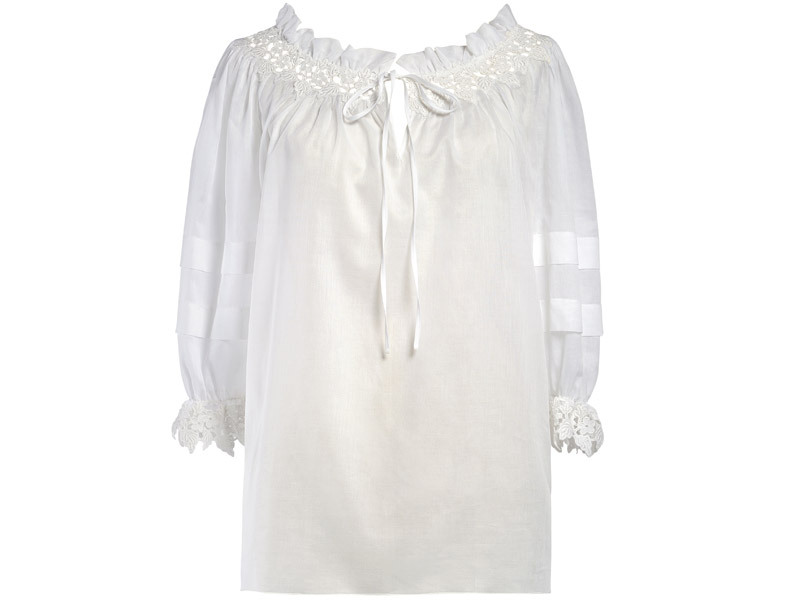 <p /> A long-sleeve lace-embroidered shirt ($670), derived from GOTS-certified organic cotton muslin. 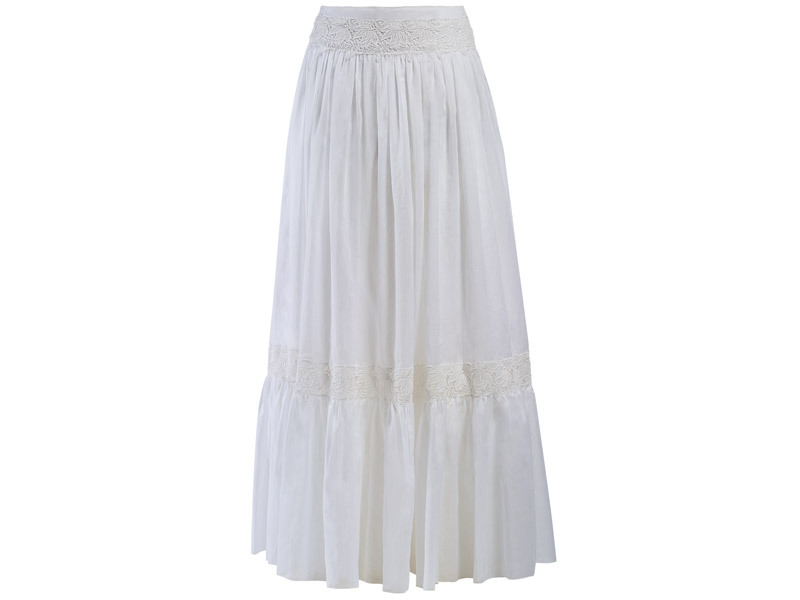 <p /> An ankle-skimming skirt ($880), produced from the same organic cotton muslin. <p /> A white pinafore dress ($1010) made from GOTS-certified organic cotton poplin. <p /> A black sleeveless dress ($1080) composed of GOTS-certified organic cotton poplin and lined with organic cotton muslin .